This study focus on internal control application based on the Sarbanes-Oxley Act. The research objective is to examine the impact of Sarbanes-Oxley Act implementation and the financial reporting reliability toward audit quality and audit opinion. The research is conducted on public companies implementing Sarbanes- Oxley Act in Indonesia. The internal audit section in the companies are used as respondents. Based on questionnaires distributed, there were 35 samples of public companies used in this research. This study employs WarpPLS to handle the SEM model in testing the hypotheses and multigroup analysis to conduct the sensitivity analysis. The research’s results showed that application of Sarbanes-Oxley Act based internal control and financial reporting reliability are positively affect the audit opinions and directly influence the audit quality. However, the independent auditor's opinion is not a moderating variables between other variables. The research results are expected to be used as considerations by the companies in implementation of Sarbanes-Oxley Act based internal control. AAA Financial Accounting Standard Committee. 2000. Commentary: SEC auditor independence requirements. Accounting Horizons. Vol.15 No.4: 373-386. Adeyemi, S. B., dan T. O. Fagbemi. 2010. Audit quality, corporate governance and firm characteristics in Nigeria. International Journal of Business and Management. Vol.5 No.5: 169-179. Adeyemi, S. B., dan O. M. Uadiale. 2010. The impact of firm characteristics and corporate governance variables on audit fees in Nigeria. Nigerian Journal of Management Studies. Vol.10 No.2: 1–22. AICPA. 1988. Code of Professional Conduct. New York: AICPA. AICPA. 1997. Joint Ethics Enforcement Program (JEEP): Manual of Procedures. New York: AICPA. Arens, A. A., Elder dan Beasley. 2008. Auditing dan Jasa Assurance Pendekatan Terintegrasi, Jilid I Edisi Keduabelas (edisi terjemahan). Jakarta: Penerbit Erlangga. Beneish, M. D., M. B. Billings, dan L. D. Hodder. 2008. Internal control weaknesses and information uncertainty, Indiana University. The Accounting Review. Vol.83 No.5: 665-703. Boyton, W. G. J., N. Raymon, dan W. G. Kell. 2001. Modern Auditing. New Jersey: John Wiley & Sons, Inc.
DeAngelo, L. E. 1981a. Auditor independence, ‘low balling’, and disclosure regulation. Journal of Accounting and Economics. Vol.3: 113-127. DeAngelo, L. E. 1981b. Auditor size and audit quality. Journal of Accounting and Economics. Vol.3:183-199. Deis, D., dan G. Giroux. 1992. Determinants of audit quality in the public sector. The Accounting Review. Vol.67 No.3: 462-479. __________. 1996. The effect of auditor changes on audit fees, audit hours, and audit quality. Journal of Accounting and Public Policy. Vol.15 No.1: 55-76. Elisha, M. S., dan B. I. Rangga. 2010. pengaruh independensi, pengalaman, due professional care, dan akuntabilitas terhadap kualitas audit. Simposium Nasional Akuntansi XIII. internal audit as a determinant of external audit fees and factors influencing this contribution. Journal of Accounting Research (December): 513-534. Felix, W. L. Jr., A. A. Gramling, dan M. J. Maletta. 1998. Coordinating Total Audit Coverage: The Relationship Between Internal and External Auditors. Altamonte Springs, FL: The Institute of Internal Auditors. Inc.
Freeman, R. E. 2010. Strategic manajemen: A stakehorder approach. Cambridge University Press. Ghozali, I. 2011. Aplikasi Analisis Multivariate dengan Program SPSS, Cetakan kelima. Semarang: Badan Penerbit Universitas Diponegoro. Ghozali, I., dan Latan. 2014. Partial Least Squares-Konsep Metode Dan Aplikasi, menggunakan Program WarpPLS 4.0. Second Edition. Semarang: Badan Penerbit Universitas Diponegoro. Ikatan Akuntansi Indonesia. 2007. Standar Akuntansi Keuangan. Jakarta: Salemba Empat. Ikatan Akuntansi Indonesia. 2011. Standar Profesi Akuntan Publik. Jakarta: Salemba Empat. Konrath, L. F. 2002. Auditing Concepts and Applications, A Risk-Analysis Approach, 5th Edition. West Publishing Company. Krishnamoorthy, G. 2001. A cascaded inference model for evaluation of the internal audit report. Decision Sciences. Vol.32: 499–520. Lai Kam-Wah. 2003. The sarbanes-oxley act and auditor independence: Preliminary evidence from audit opinion and discretionary accruals, department of accountancy, City University of Hong Kong. Social Science Research Network Electronic Paper Collection. Lennox, C. S. 1999. audit quality and auditor size: An evaluation of reputation and deep pockets hypotheses. 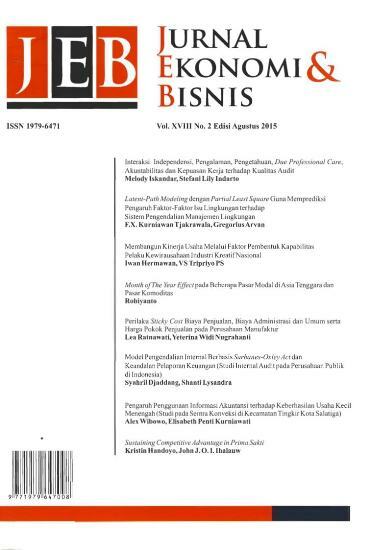 Journal of Business Finance & Accounting. Vol.26 No.7 & 8 (September/Oktober). Mansouri, A., R. Pirayesh, dan M. Salehi. 2009. Audit competence and audit quality: case in emerging economy. International Journal of Business and Management. Vol.4 No.2: 17-25. Murdijaningsih, T. 2014. Sarbanes-Oxley role in the detections financial statement fraud in Telkom to support good corporate governance. Economics Faculty Wijayakusuma University, Purwokerto. concepts of exchange theory. The Accounting Review: 335-346. Pusat Bahasa Departemen Pendidikan Nasional. 2002. Kamus Besar Bahasa Indonesia, Edisi Ketiga. Jakarta: Balai Pustaka. Sugiyono. 2009. Metode Penelitian Bisnis. Cetakan keempat belas. Bandung: Alfabeta. Sugirachmawati dan Djaddang. 2014. Pengaruh penerapan sarbanex oxley act dan keandalan pelaporan keuangan terhadap opini audit. Riset. FEB UMB, Jakarta. Suraida. 2005. Pengaruh etika, kompetensi, pengalaman audit dan risiko audit terhadap skeptisisme profesional auditor dan ketetapan pemberian opini akuntan publik. Jurnal Sosiohumaniora. Vol.7 No.3: 186-202.